From the centre of Bangkok, head for Phra Pinklao Bridge. Cross the bridge and continue on Pinklao Road for 35 km. until you reach the junction with the A2. Turn right, following the signs for Ratchaburi. Pass through Nakhon Chaisri and the Nakhon Pathom bypass. About 5 km. further from the bypass, look for the flyover and the sign for Kanchanaburi. Take the flyover and continue on the A323 to Ban Pong. From Ban Pong, follow the signs to Kanchanaburi (another 50 km.). Once you pass Kanchanaburi town for about 6 km., there is a junction, turn left and following the signs to the Saiyoke Noi Waterfalls. The Phutakien Pier (Resotel Pier) is located about 60 km. from the city centre and about 8 km. 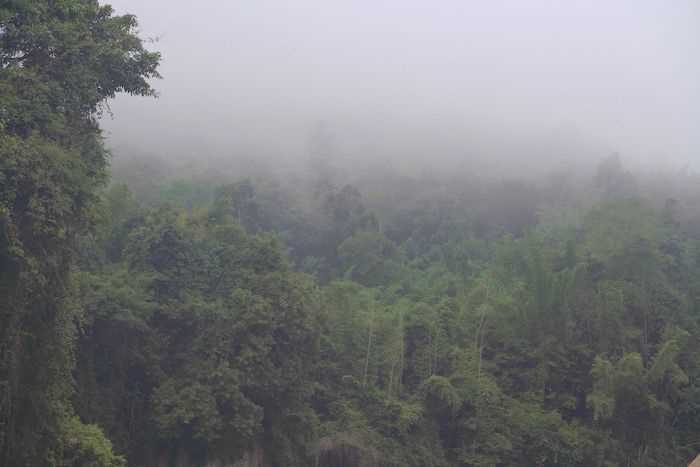 from the Saiyoke Noi Waterfalls. 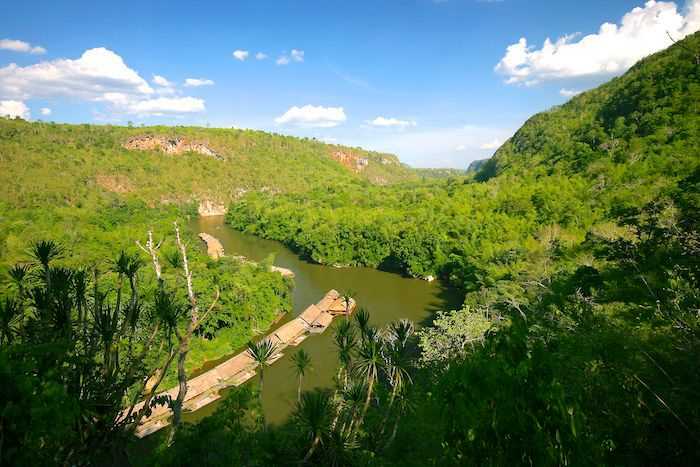 Then catch a long-tailed boat from Phutakien Pier (Resotel Pier) to River Kwai Jungle Rafts. 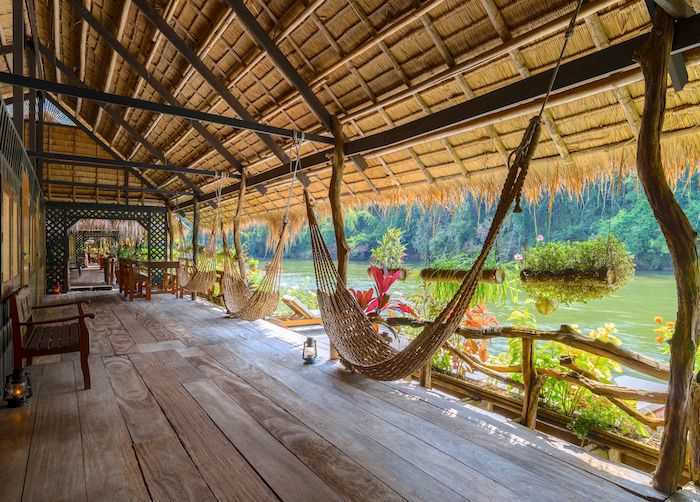 All guest rooms are stunningly floating on the River Kwai. 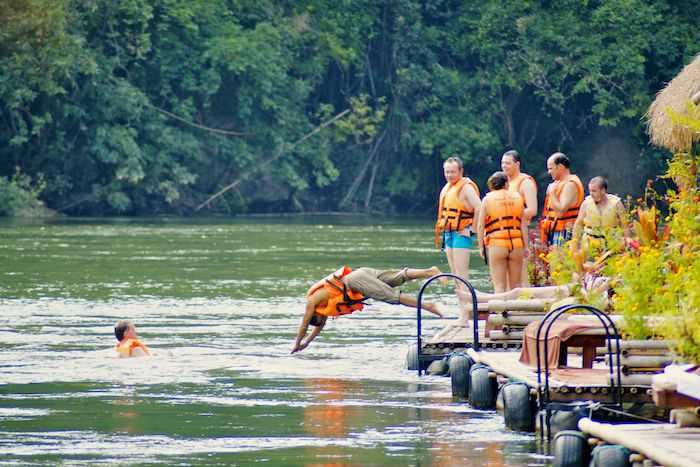 River Kwai Jungle Rafts is authentic relaxing getaway as one of our aims is to grant guests to be close to nature with natural cooling from the river underneath the raft. 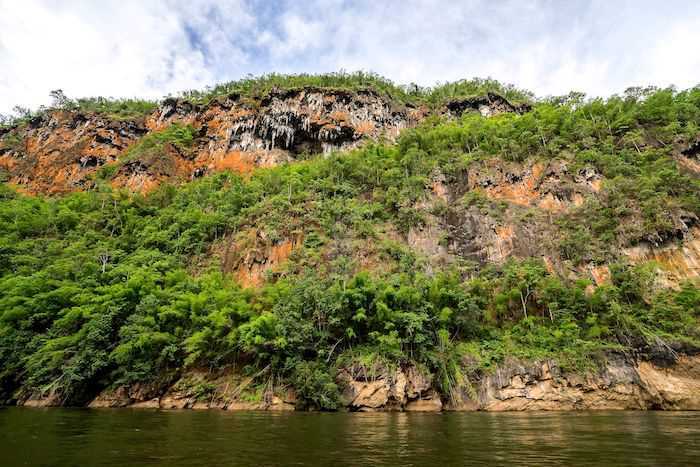 You will be one of a few people who experiences living and sleeping on the world’s historic river. At night, in this “hassle-free” hideaway, instead of using electricity, we use wick lamps for lighting to conserve the natural surroundings and concept. The light from wick lamps wonderfully awards the romantic ambience at night. We spent one evening here and it was blissful! 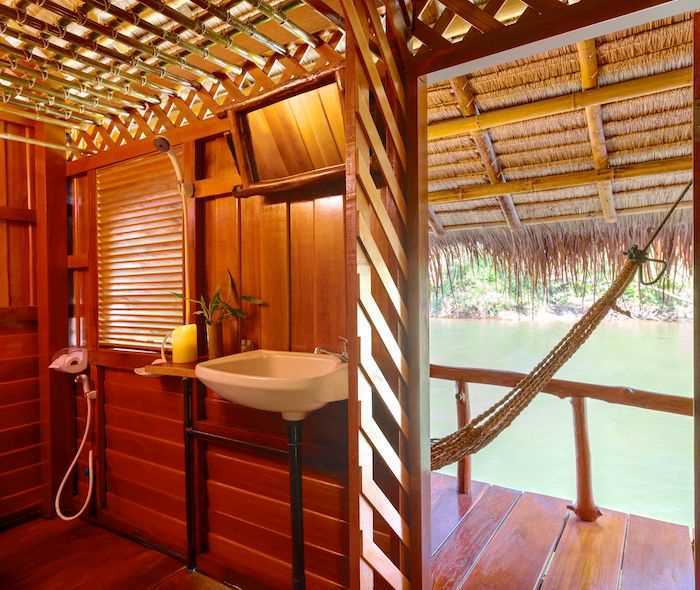 Each raft holds about 4 cabins, each of which has a bedroom and a very basic bathroom (each raft has its own septic tank so effluent is not going untreated into the river). 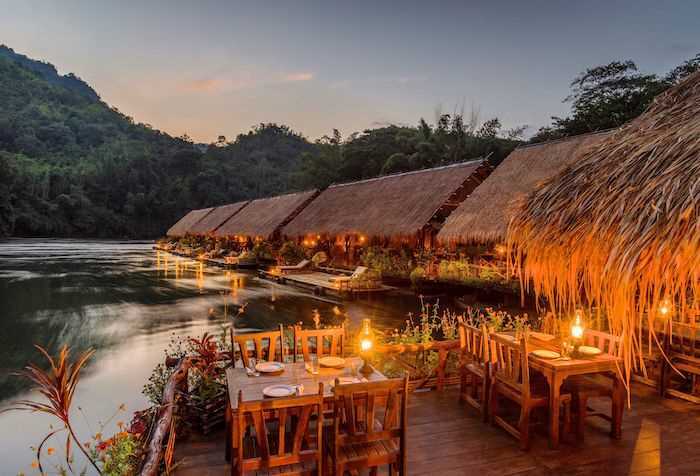 Imagine the delight after a speedy Longboat trip up the River Kwai to step aboard an array of bamboo rafts, with a restaurant (and great Thai meals) shady thatched verandahs and comfortable bures complete with ensuites and mosquito nets.